latest announcements on Facebook and Twitter! Our photos look best when viewed on a properly calibrated monitor. While not a true calibration, a quick and easy way to get close is to adjust your monitor until you can see all eleven (11) distinct shades of gray in the image below. 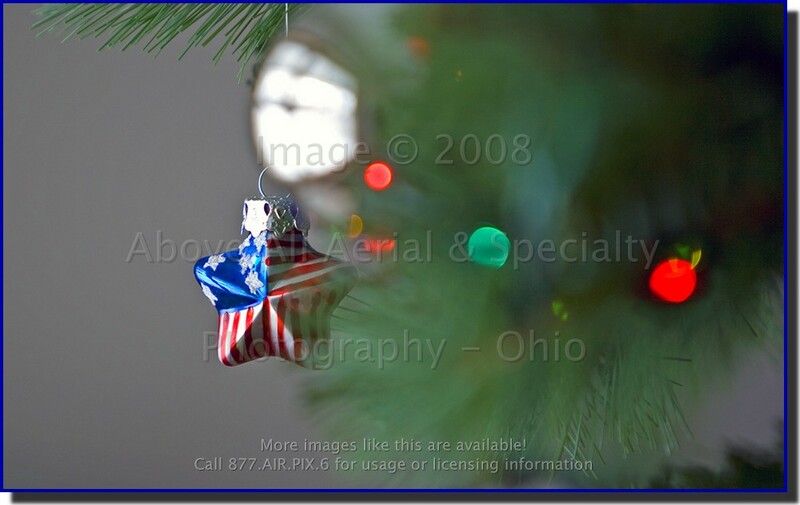 We are thinking about our service men and women who are unable to be home with their families and friends this holiday season. We thank them for their selfless service and wish them a safe tour and trip home as soon as possible. Click picture to enlarge. You may have to temporarily disable pop-up blocking. A huge flock of geese found this opening in the ice and decided to call it home for a bit. 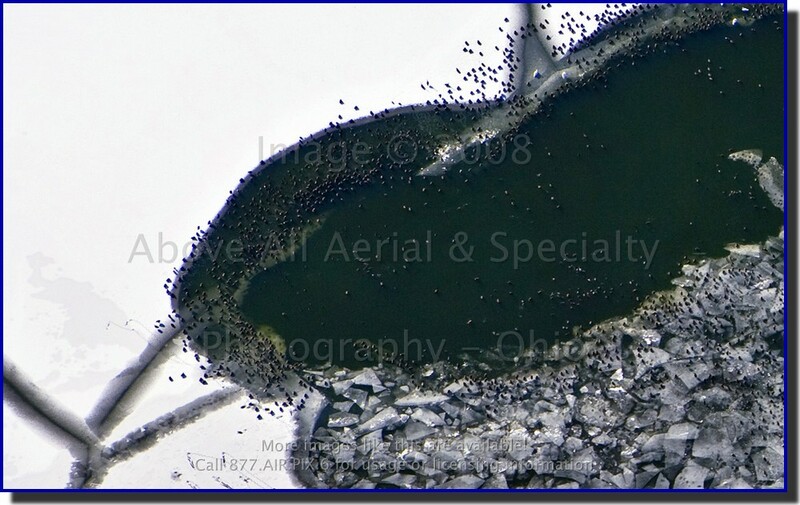 Hundreds of them can be seen surrounding the hole, in the water, and on the broken pieces of ice at the bottom of the photo. Amongst all the geese, I can see at least 5 large white ducks - can you? 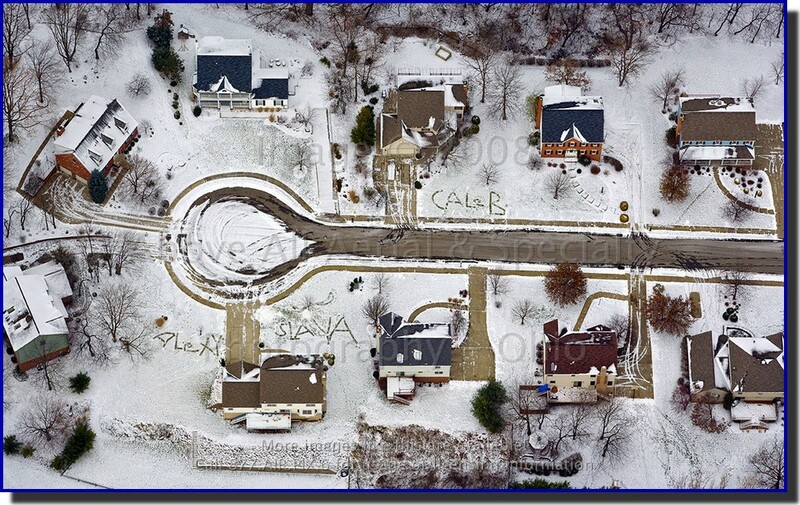 I don't know if the snow artists featured here were just having fun or making sure that Santa knew where their houses were, but we really enjoyed seeing their work! 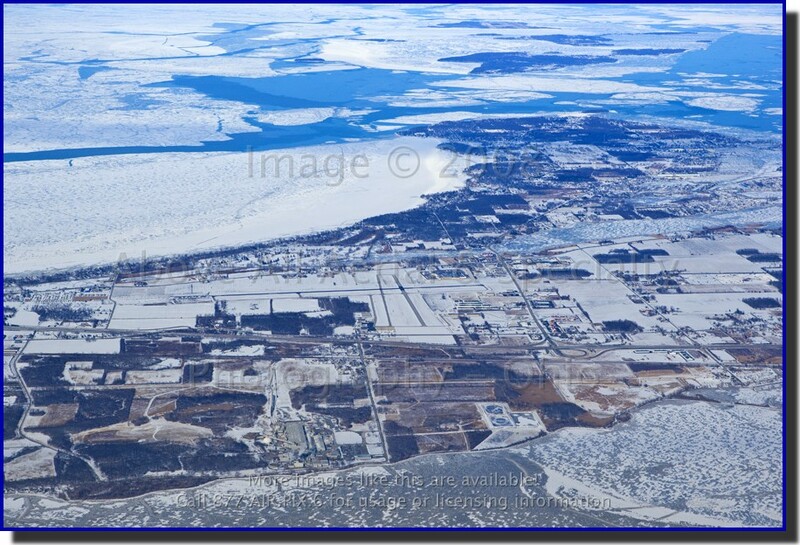 Winter flying can be both beautiful and fun, but unfortunately, winter weather can keep us grounded for long stretches at a time - 10 or 14 days is not uncommon! 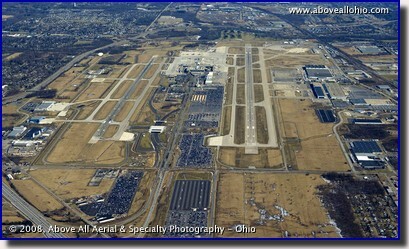 Because of this, when we are able to fly, we usually have a very full schedule. 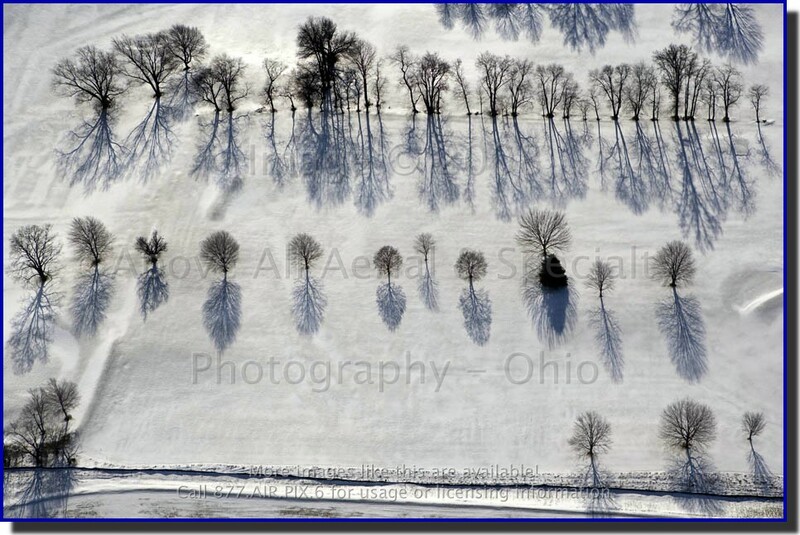 If you need aerial photos this winter, your best bet is to plan ahead - the more notice you can give us, the better chance you have of getting beautiful photos by your deadline! 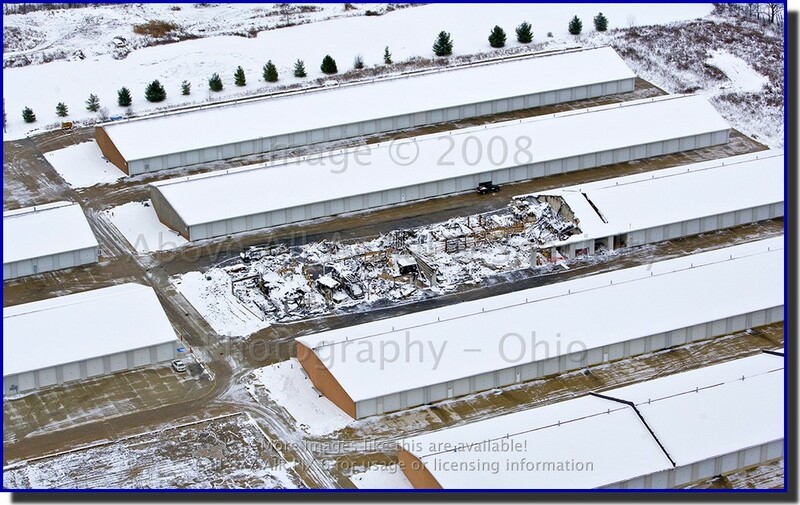 Many high-dollar items were lost in the fire that destroyed half of this self storage building including a rare automobile and an RV. Luckily, the fire department (with a little help from the built-in firewall) was able to save the other half of the building. We hate to see things like this happen to anyone, but when it does, it is helpful to have before and after photos on hand for insurance purposes. 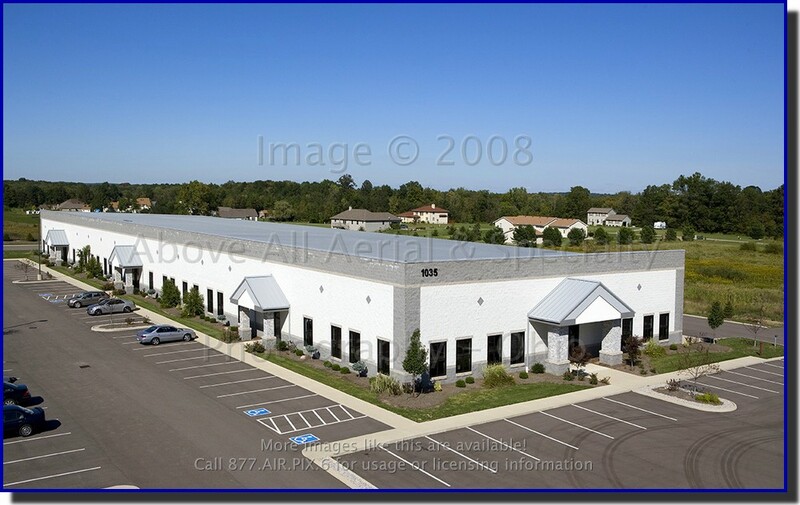 Give us a call and let us help you document your building(s) and property today! 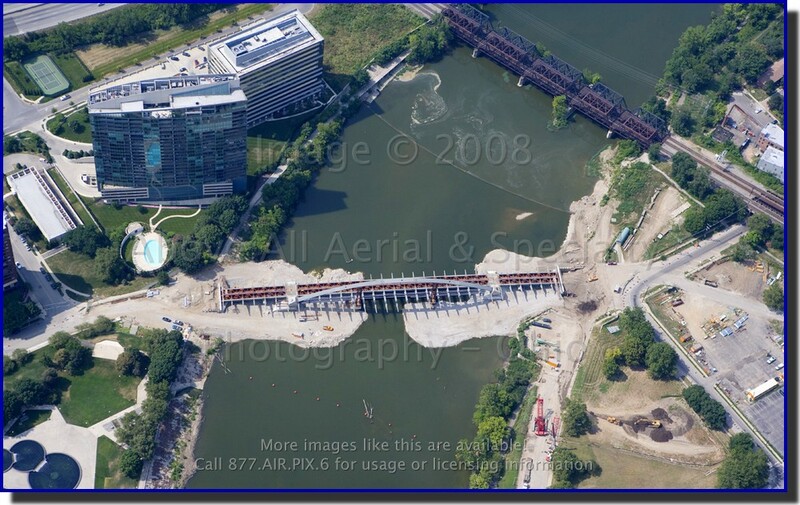 Aerial construction progress photography is great for static presentations at progress meetings, but what if you need a dynamic (and more dramatic) presentation to impress the "big wigs" or investors? 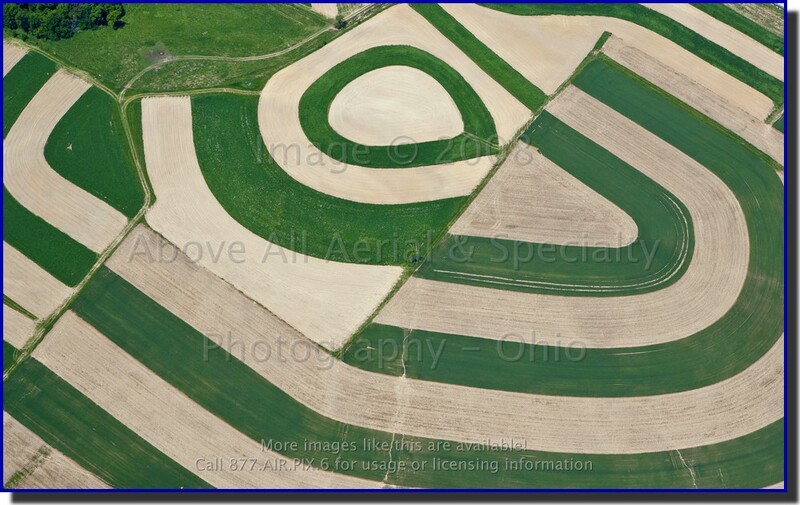 Time lapse aerial photography could be the answer. 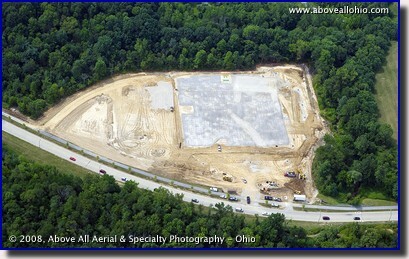 We can create an HD time lapse video from your construction progress aerial photos. The video will surely add a WOW factor to your presentations or website. Give us a call - we'll work with you to create the perfect video! Note that the images to the left are being displayed as a slideshow of still images, not a video. In a video, transitions can be more controlled resulting in a smoother presentation. 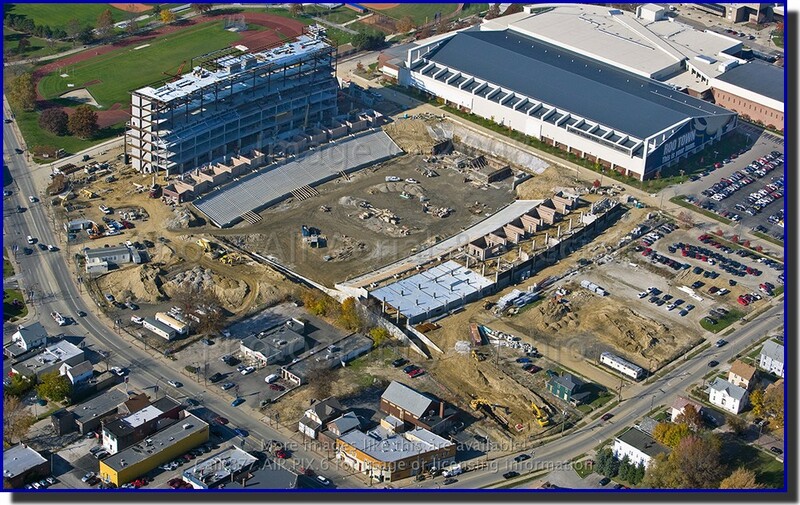 The University of Akron is building a new stadium on campus. 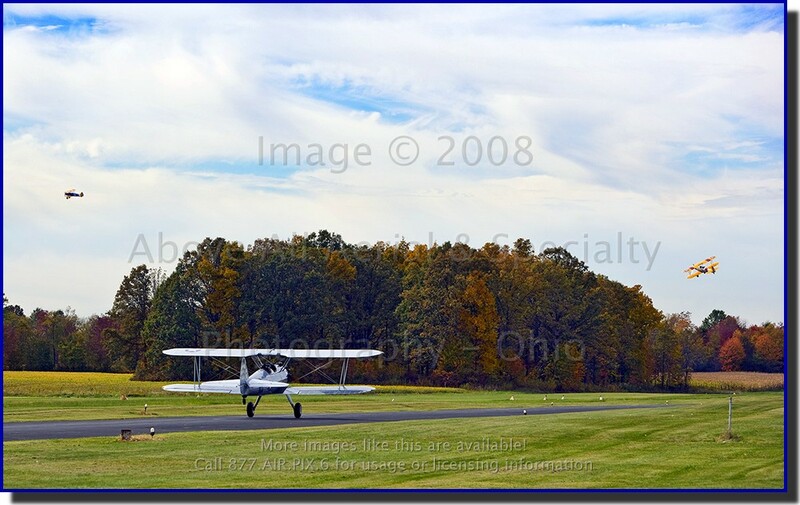 Currently, the Zips football team plays its games off campus at the Rubber Bowl near the Akron Fulton airport. The new stadium will be much more convenient for students and fans alike. Mary Waickman Stable provides horse and equestrian training as well as boarding services. 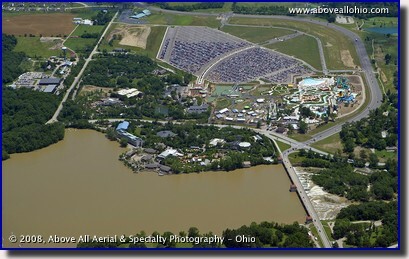 It is located in Medina, Ohio, just a short drive from Cleveland and Akron. 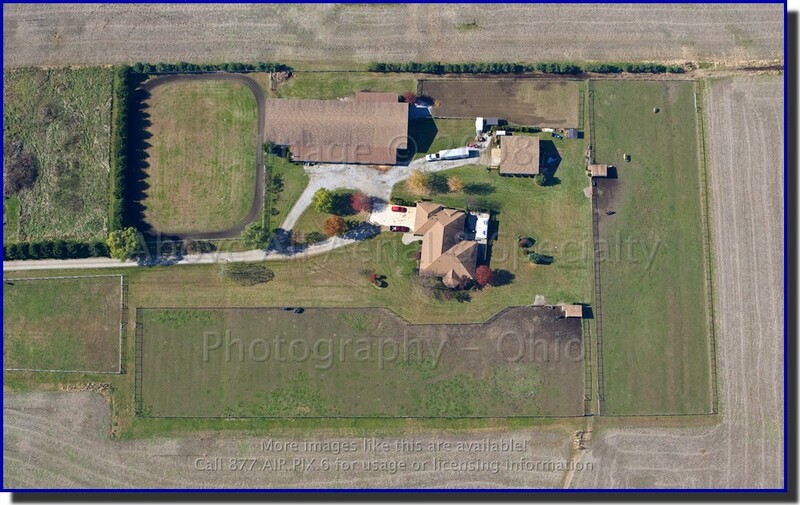 A "near vertical" overhead view such as this is ideal to show customers and clients the layout of your property or facilities. 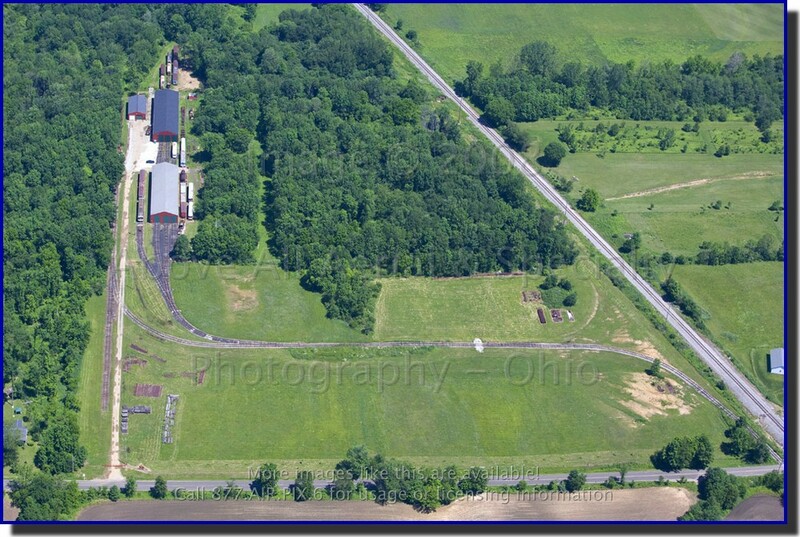 Mary's stables, year round indoor riding arena, outdoor ring, and grazing fields are easily seen here. 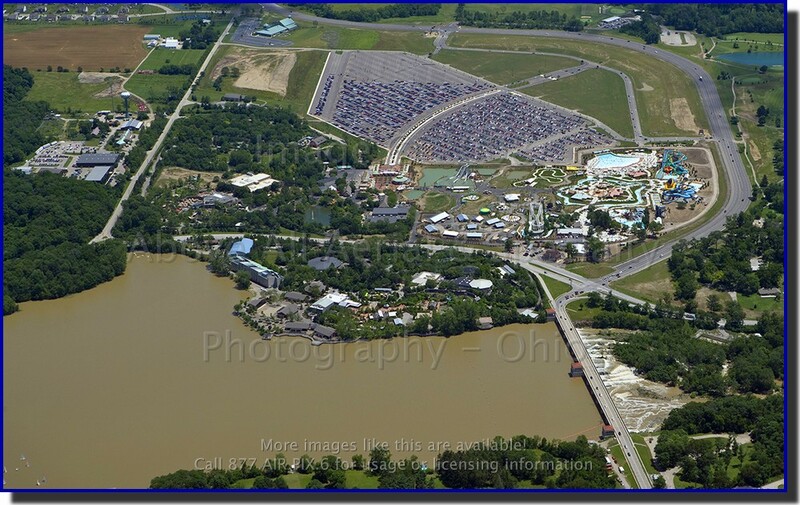 This wide angle view of Cedar Point in Sandusky, Ohio, was created by stitching together multiple aerial photographs. We could have captured the same view in a single photo, but this method allows us to create very large high quality prints. 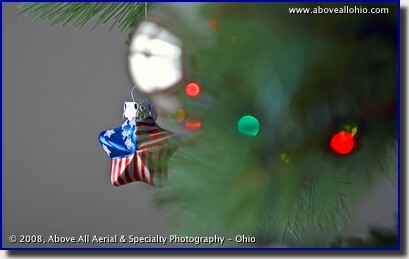 This particular image could be printed in photographic quality at over 7' wide! Interested in a stunning wall sized panaoramic image for your conference room or lobby? Give us a call today to discuss the possiblities! 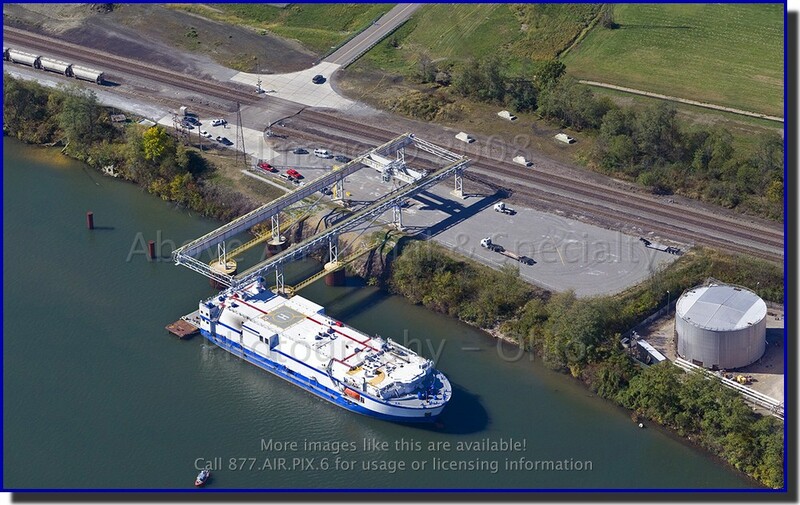 "Planes, Trains, Automobiles, Trucks, Ships, and Rockets"
This ship - docked at the intermodal yard in Wellsville, Ohio - is being loaded with components that will be used on the Ares I-X, NASA's first test rocket for its next generation human space vehicle. The components were designed and built at NASA's Glenn Resarch Center in Cleveland. After being loaded, they will travel down the Ohio River, the Mississippi River, out through the Gulf of Mexico, and around Florida before finally arriving at the Kennedy Space Center. The trip will take 12 days. 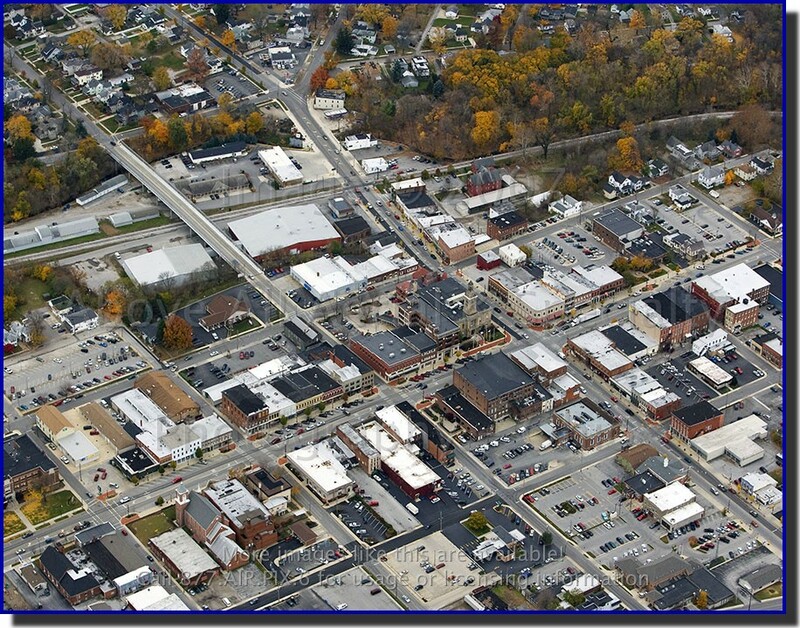 The city of Medina, Ohio, located about 30 miles south of Cleveland, is known for its quaint shops downtown on "The Square". The Square is visible here - it is marked by the group of trees in the center of the photo. 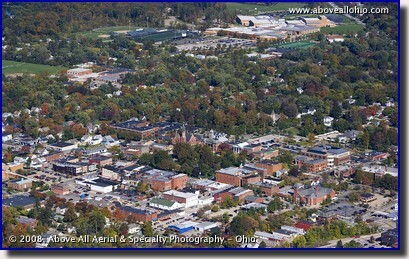 The Medina High School campus is visible at the top of this photo (northeast of downtown). The beautiful town of Oak Harbor, Ohio, is located about halfway between Toledo and Sandusky. It is surrounded by golden brown fields ready for the autumn harvest. 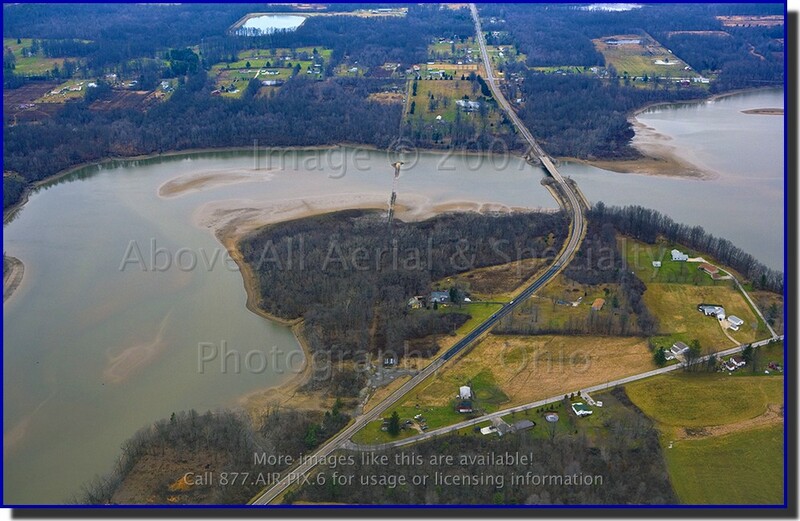 The Portage River, which runs along the southern city limit, makes its way east where it empties into Lake Erie at the city of Port clinton. The Lake Erie Islands - nearly 20 miles away - are visible in the background of this photo taken on a spectacular Ohio fall day. 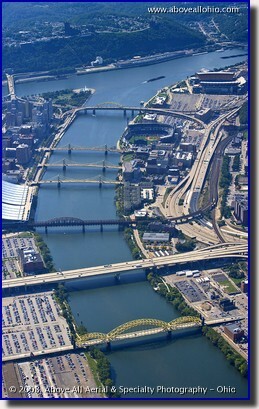 Many bridges cross the Allegheny River in downtown Pittsburgh, PA. The bridge at the bottom of the photo is the 16th Street bridge. 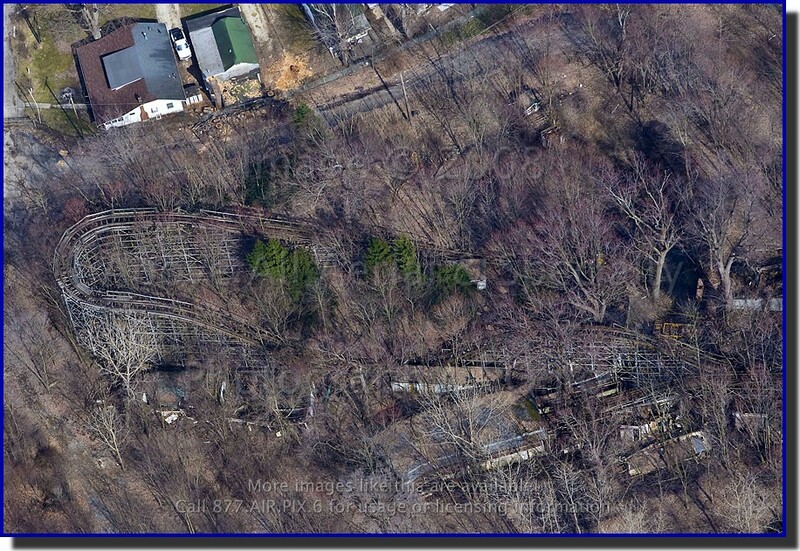 Working up from there are bridges for I-579, Norfolk Southern Railway, 9th, 7th, and 6th Streets, and finally I-279. 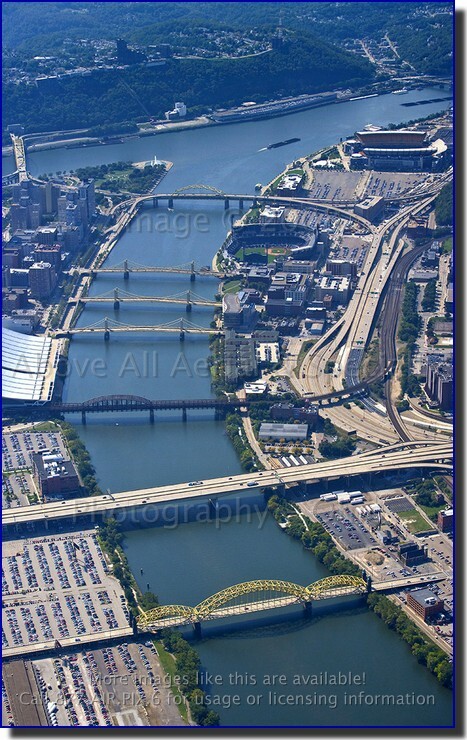 Heinz Field (home of the Steelers) is visible at the top right where the Monongahela and Allegheny Rivers meet to form the Ohio River. 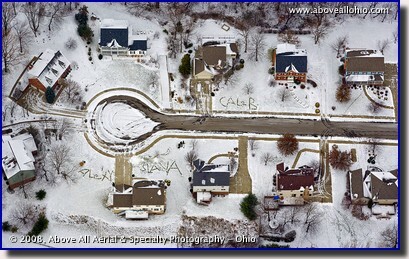 Aerials are great for showing the big picture, but sometimes a close up view is more desirable. 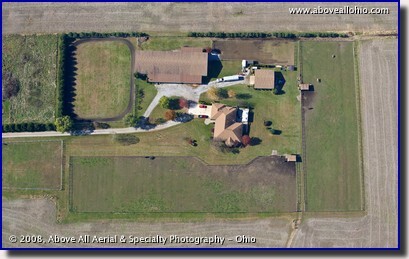 Unfortunately, an ordinary ground level shot may not provide the same visual impact as an aerial. What's a savvy marketing professional to do? Simple! 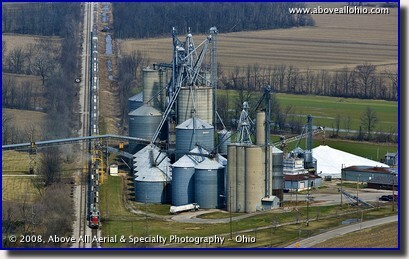 "Bucket truck" photography - a service provided by Above All Ohio - provides the best of both worlds! The unique perspective from 10 to 40 feet above the ground may be just the thing that makes a property stand out above the rest. Call us today to discuss your project - we're here to serve you in the air, on ground, and everywhere in between! 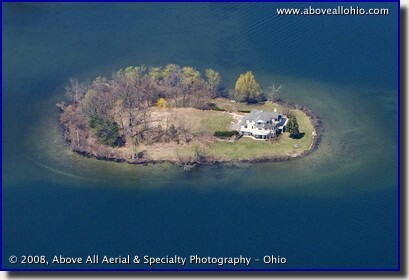 South Bass Island in Lake Erie is a popular summer destination for many people. 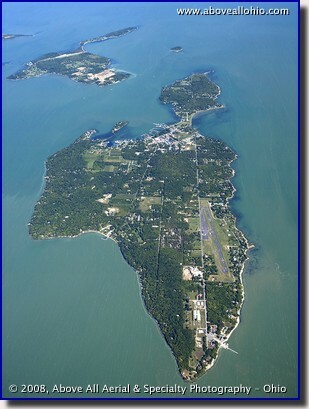 Put-in-Bay is known for its historic houses, wonderful restaurants, and fun night life. From the harbor on this island, Oliver Hazard Perry defeated the British navy during the war of 1812. A 352 foot tall monument stands on an isthmus commemorating the victory. A ship is unloading coal at this power generating facility along the St. Clair River near Port Huron, Michigan. 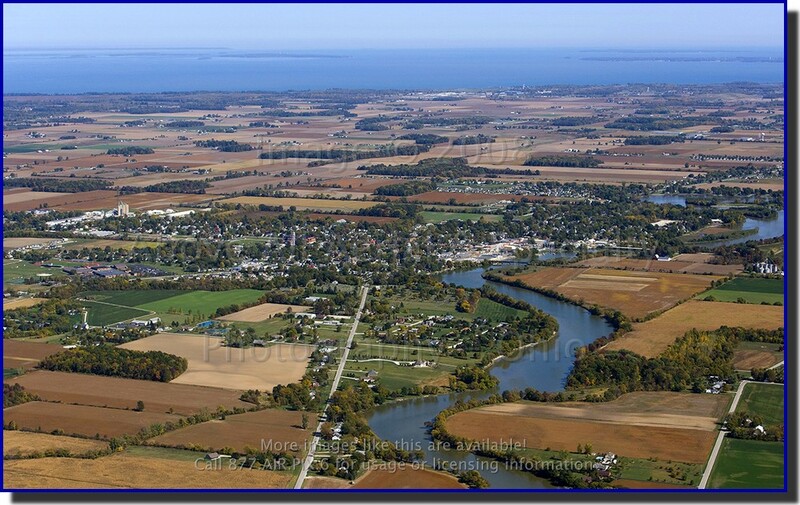 The river is part of the Great Lakes system, connecting Lake Huron with Lake Erie (or more accurately, Lake Huron with Lake St. Clair...). 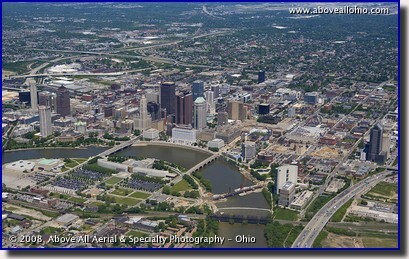 This wide angle view of Columbus, OH, is looking northeast. 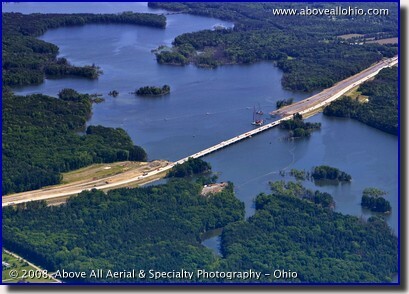 The new Main Street Bridge (the subject of last week's photo) is visible in the lower center of the photo at an earlier stage of construction. At the extreme left edge, a small piece of the convention center is visible. 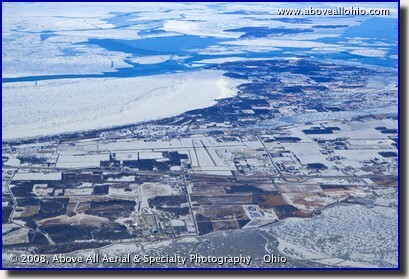 The light gray area in the far upper right corner is Port Columbus International airport. 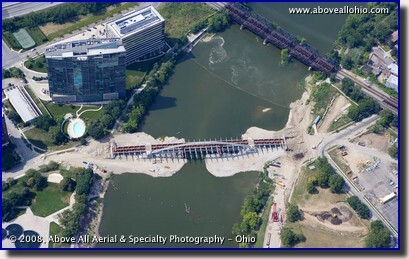 The new Main Street Bridge over the Scioto River in Columbus, Ohio, is scheduled to be completed in June 2009. The $44 million dollar bridge will accommodate both vehicular and pedestrian traffic. More interesting information on this project can be found on Wikipedia. This aerial view shows one of two new elementary schools being built simultaneously in Medina, OH. 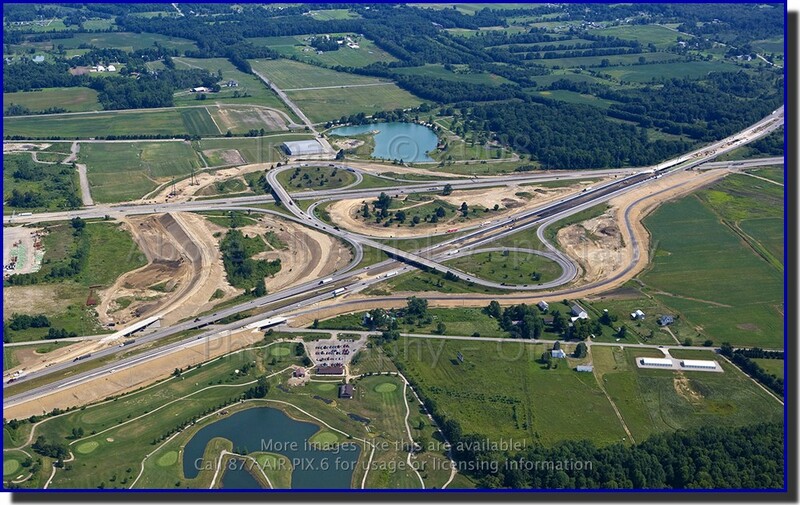 Aerial views such as this can educate contractors, owners, financial backers, and many others quickly on the overall status of their projects. Much more can be learned from the air than from the ground, and no one has to pull an all- nighter to gain a thorough understanding of the material presented! 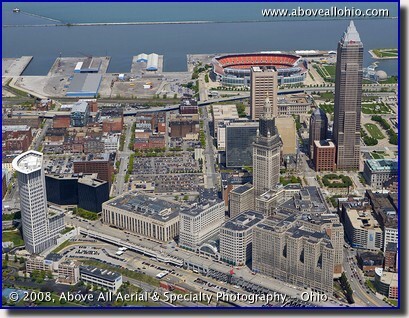 The heart of downtown Cleveland is beating - a new "Medical Mart" convention center may soon be located at Tower City (located at bottom center of this photo), which would further cement Cleveland's image as a leader in medical technology. 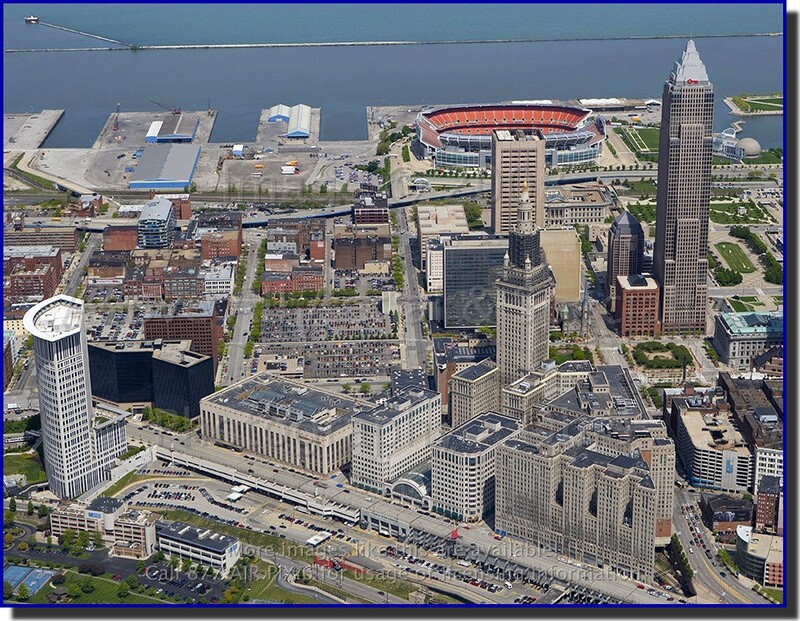 Also, plans to relocate the Port of Cleveland from its current location (at the top of the photo, west of Cleveland Stadium) to a new modern site east of Burke Lakefront Airport were recently released. This is an updated view of the construction taking place where interstates 71 and 76 meet. By comparing this photo to one we took last May, you can see how far they've come. How many differences can you see? 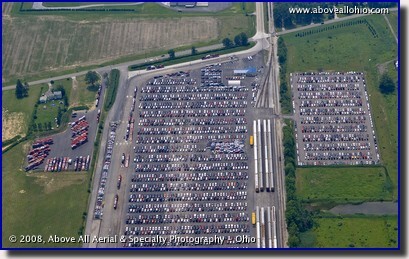 A large inventory of brand new cars awaits shipment by rail and truck. 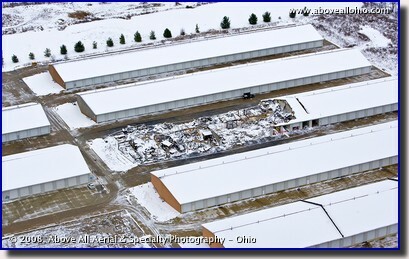 Some of the 40 rail cars at this site near Youngstown, Ohio, are cut off at the bottom of the photo. 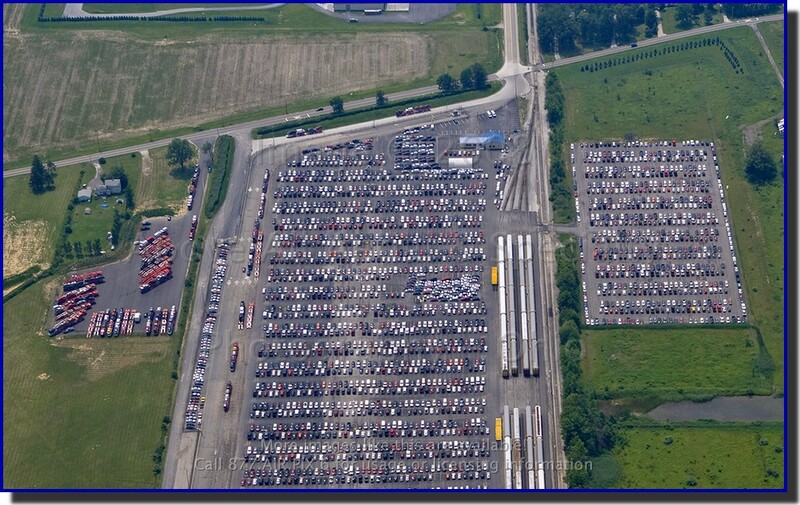 About as many trucks are visible in various locations around this lot. 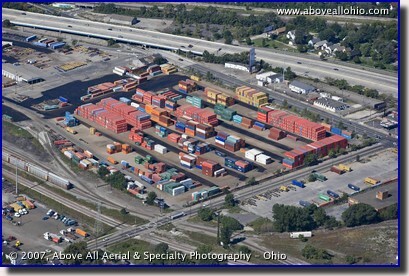 Aerials make a great visual record for companies who have large inventories of products or raw materials outside. 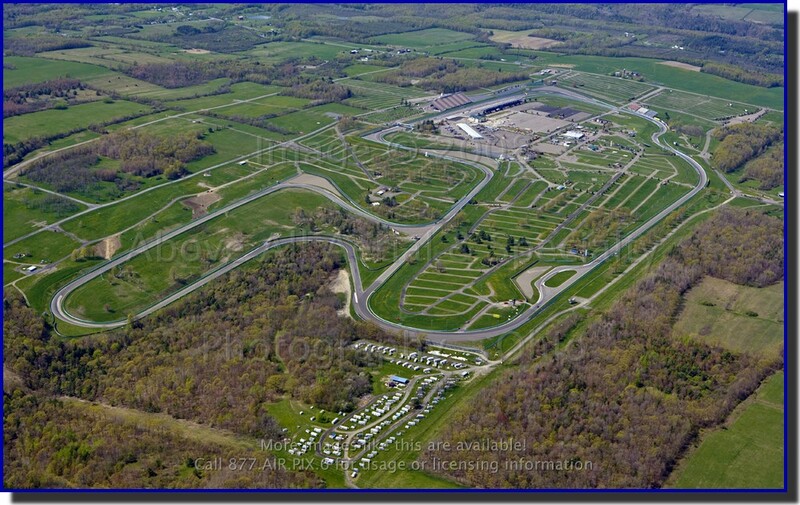 This historic race course in Watkins Glen, NY, has hosted legendary drivers from virtually all of the top road racing series in the world. 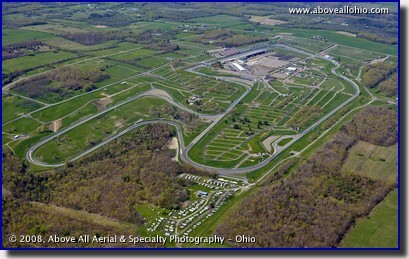 The track is located in the scenic Finger Lakes region of upstate New York. As the price of oil rises, the demand for alternative fuels also rises. Ethanol, made from corn and other types of grain, is one such renewable energy source. As more and more ethanol plants are built around the country, trains like the one visible in this photo may become more common. 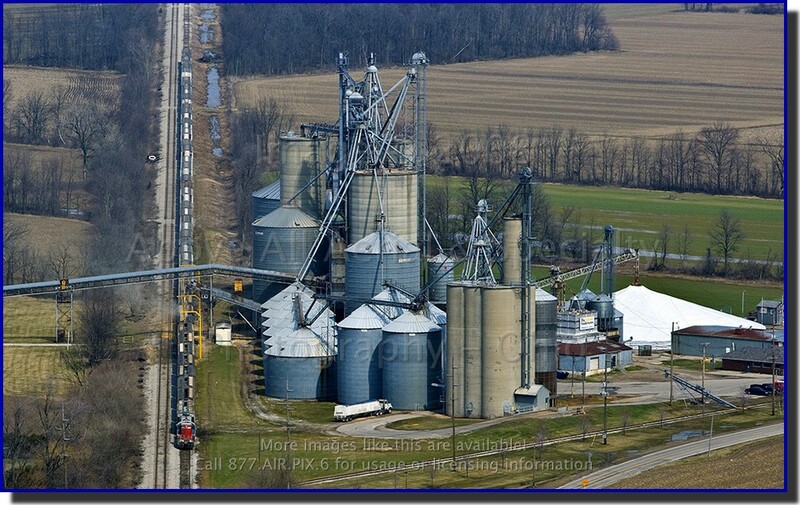 At least 53 cars are being loaded at this grain elevator in Metamora, Ohio, just west of Toledo. The Northern Ohio Railway Museum - or "NORM" as it is known - is located near Chippewa Lake, OH, and the intersection of Interstates 71 and 76 in Medina County. This non-profit organization specializes in restoring streetcars and other railway equipment from the trolley era. If you are looking for something to do on a Saturday afternoon, the friendly and knowledgeable staff would be happy to give you a guided tour of the museum. Admission to the museum is free, but as with any not for profit company, donations of any size are always welcome! 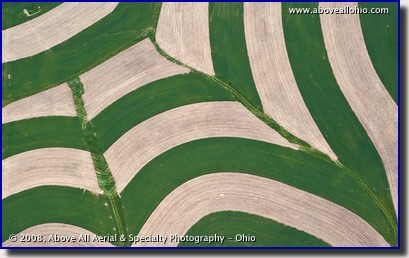 These unusual patterns really catch the eye when flying. Farmers often plant crops in alternating bands like these when the fields are not nice and flat. 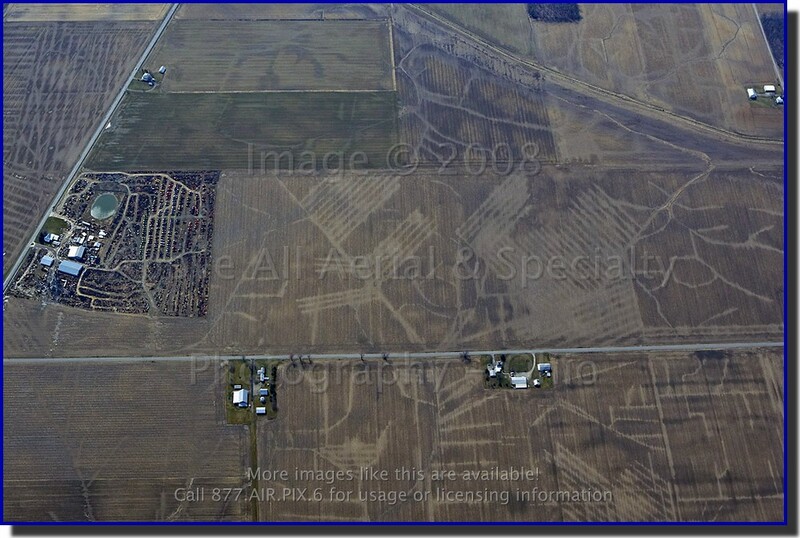 The patterns follow the contour of the ground. Strip farming, as it is known, is one of many simple and environmentally friendly techniques used by farmers. By alternating seasonal crops in bands, the entire field is never bare so water can not run freely down the slopes. This helps stop erosion of the valuable and fertile top soil. "It's the Big Rectangular Building"
Sometimes, a verbal description just doesn't cut it. Aerial photos quickly and effectively communicate the location, the relative size, the nearby amenities the accessibility, and many more selling points of a property for sale or lease. 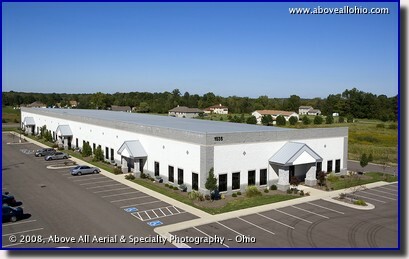 When marketing a warehouse or industrial property, savvy real estate professionals know that an aerial photo is worth much more than a thousand words. 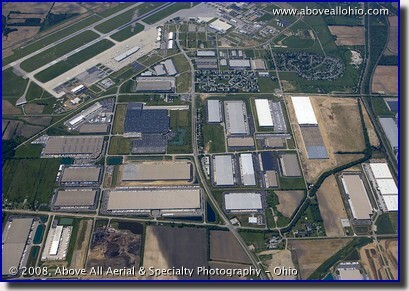 This particular industrial park is located just north of Rickenbacker International Airport in Groveport, Ohio. Click here to see more views on an interactive map. The Flats in downtown Cleveland is undergoing some changes. 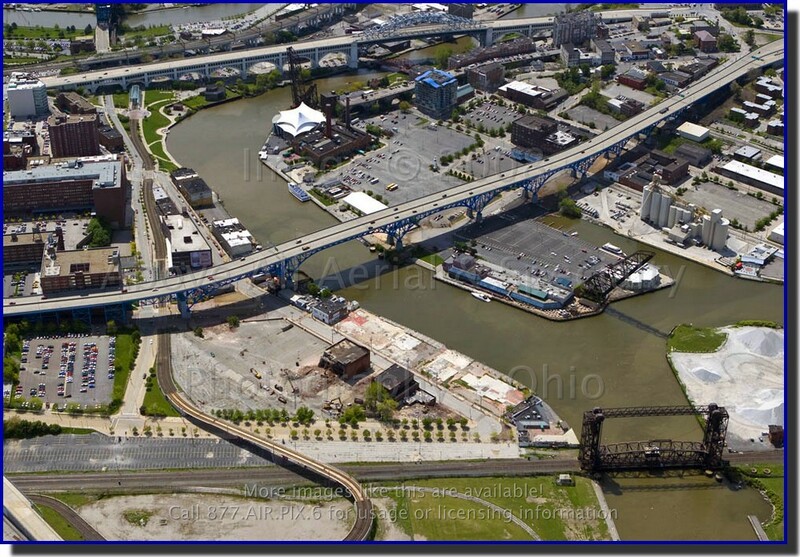 New environmentally friendly development work has started here - the Flats East Bank will be an up-scale, mixed use development close to downtown. Be sure to check out GreenCityBlueLake's planning and development pages for more information and an architect's illustration of the area. 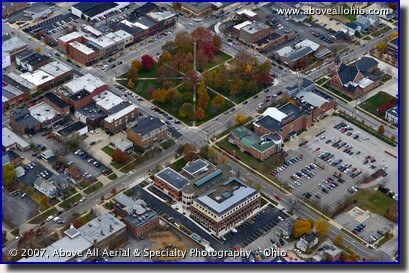 This photo shows about half of the University Circle community in Cleveland. 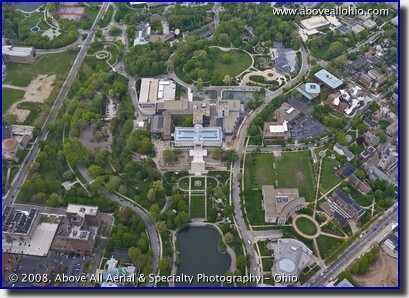 In the center of the photo is the Cleveland Art Museum. 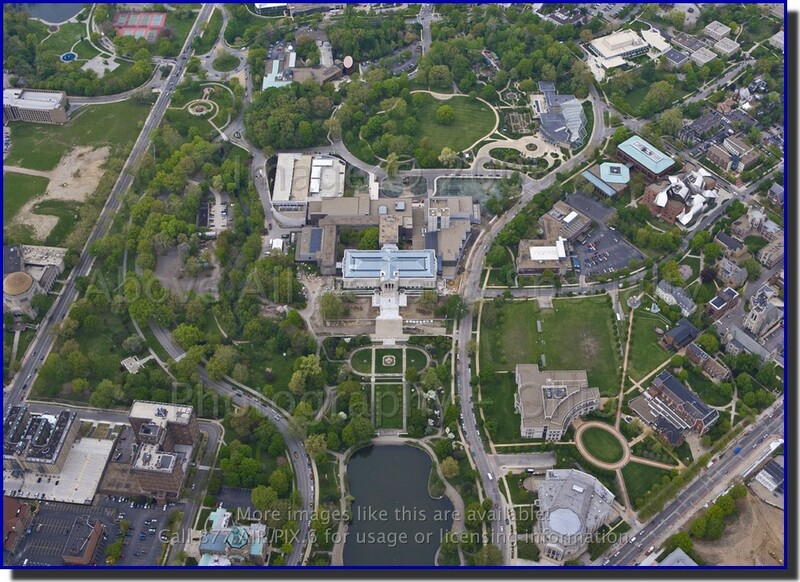 Towards the upper right is the Cleveland Botanical Garden and to the lower right is Severance Hall (home of the Cleveland Orchestra). If you can stand just one more link, here is one to an interactive map based on the geocoded information embedded into the photo. Aerial photographs can be invaluable tools in the courtroom. 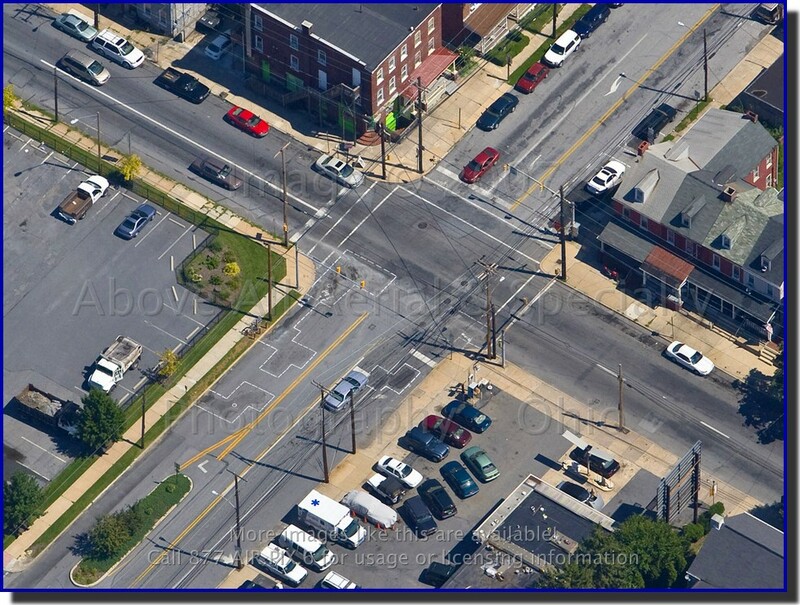 This is a very low resolution image and does not show the true amount of detail that we are capable of capturing - the full size image clearly shows manhole covers, pavement markings, and even the pavement condition. This particular image was used as the background for an animation depicting a serious (but non-fatal) accident. While not graphic, the movie is realistic enough to be a bit unsettling - click here under advisement if you wish to view the animation. If you would like more information on the company that created the animation, please contact us. Ok, the title is cheesey, we know... 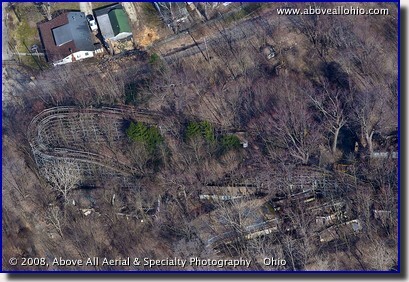 This photo is of the Big Dipper - an old wooden roller coaster at the abandoned amusement park of Chippewa Lake. 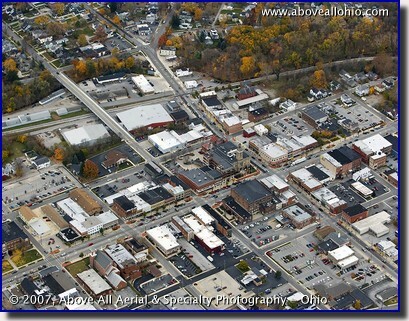 This photo was taken in late spring - just before the trees fill out and block the view again for the summer. An interesting write up on (and more photos of...) Chippewa Lake can be found on forgottenoh.com. There has been a lot of news lately about cancellations of flights involving this aircraft - the MD-80 - but we were lucky enough to catch one that is still flying! All joking aside, despite it's recent bad press, the MD-80 has an excellent safety record since first going into service in 1980. The thorough inspections currently being done on these planes may be inconvenient, but they are a necessary safety precaution. 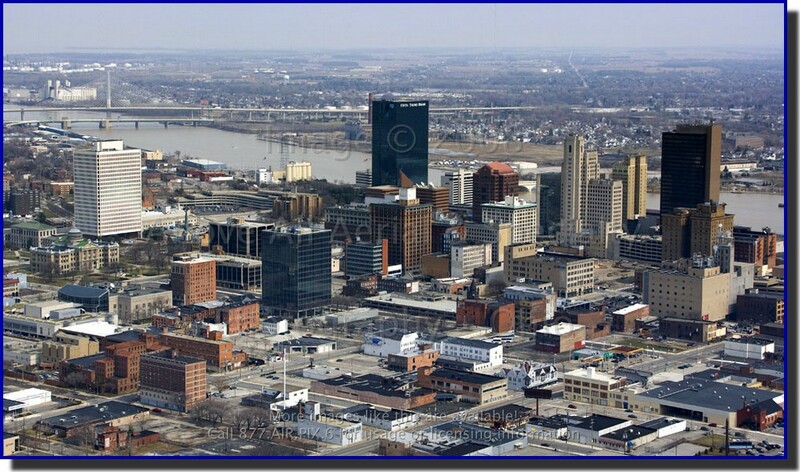 Downtown Toledo, Ohio, is located along the Maumee River where it empties into Lake Erie. In this low level aerial photograph taken from a helicopter, we can see the architecturally diverse landscape. The modern Fifth Third Bank building stands in contrast to the classic turn of the century (last century!) 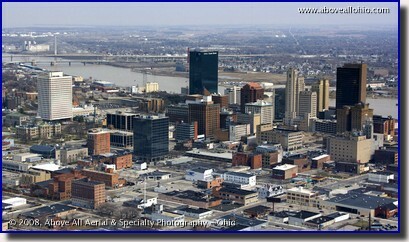 Lucas County Courthouse, visible on the left edge of the photo. 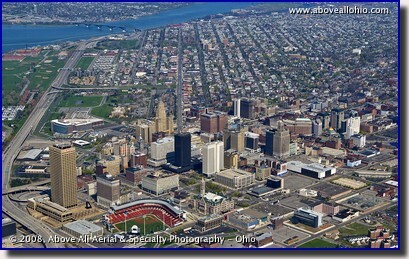 The newest addition to the skyline is the distinctive Veteran's Glass City Skyway suspension bridge in the background. 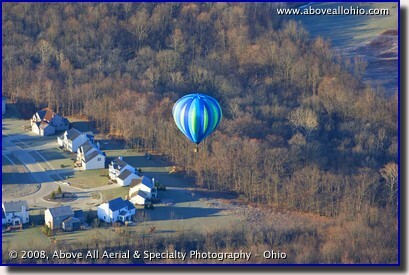 "Air to (Hot) Air Photography"
Because of the calm winds, early morning is often the best time of day for floating above the world in a hot air balloon. 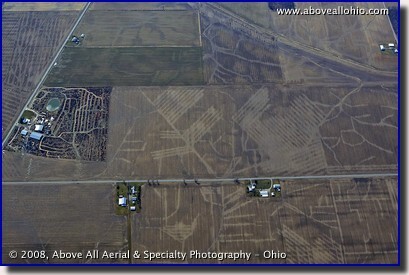 This is one of four that we spotted over north eastern Ohio on an early spring day. 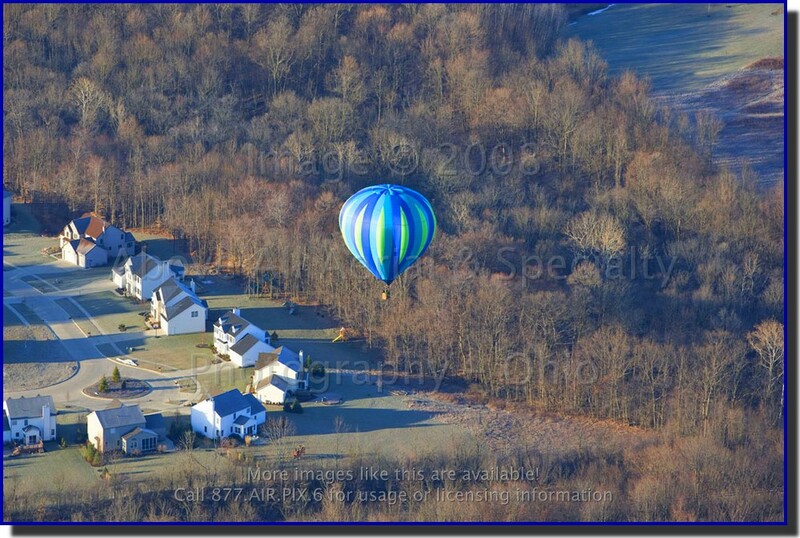 The trees and grass are still waking up from their winter sleep and the balloons added some nice color to the landscape. Spring is here - and robins aren't the only ones who will be busy building things! Unfortuantely for robins, we can't help them "stay on top" of their projects. 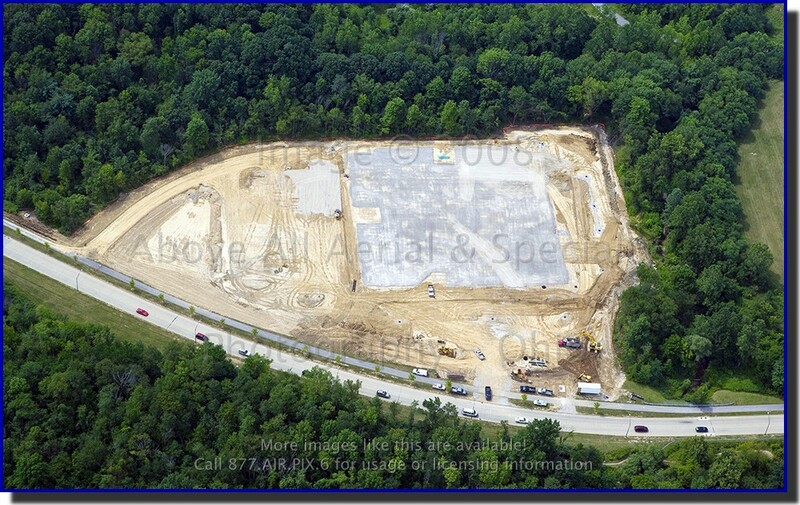 However, more and more general contractors, construction managers, project managers, and building owners are discovering that aerial photographs provide a wealth of information. Construction progress photos are just another tool of the trade - a great way to document the progression of work, show who was working where and when, and keep a visual record of what the site conditions were throughout the project. 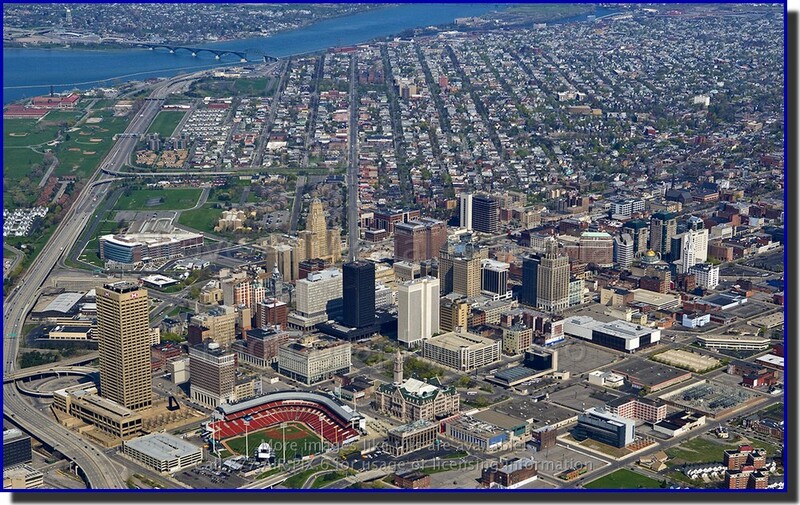 We think you'll agree that this photo feels a little more like baseball season than than last week's shot of Canal Park! 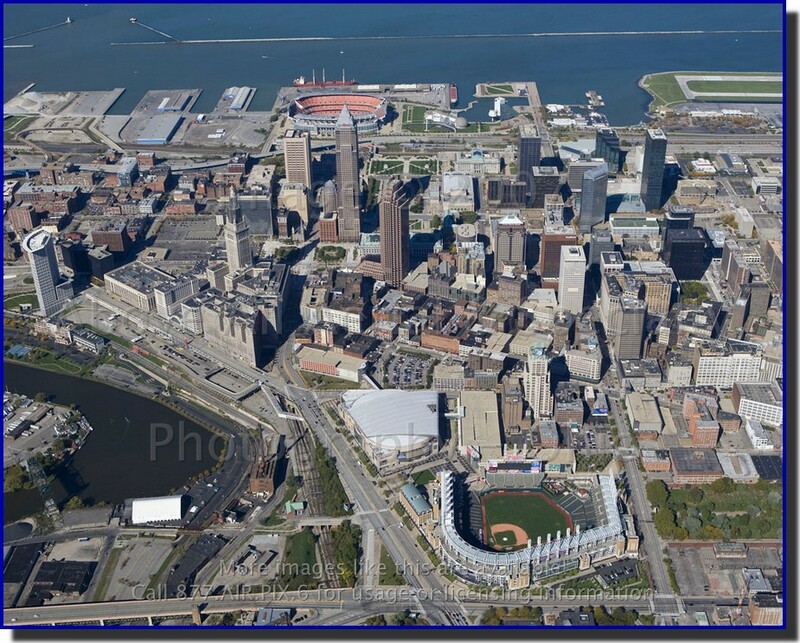 Jacobs' Field - er, we mean Progressive Field - is in the foreground of this shot of downtown Cleveland. 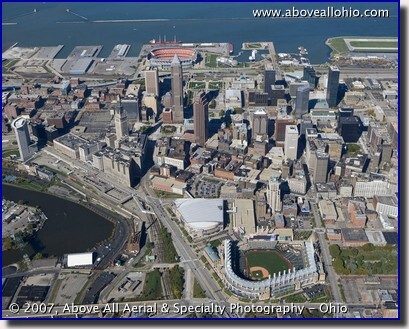 Cleveland Stadium, the Great Lakes Science Center, and the Rock and Roll Hall of Fame are all visible in the top center of the photo. 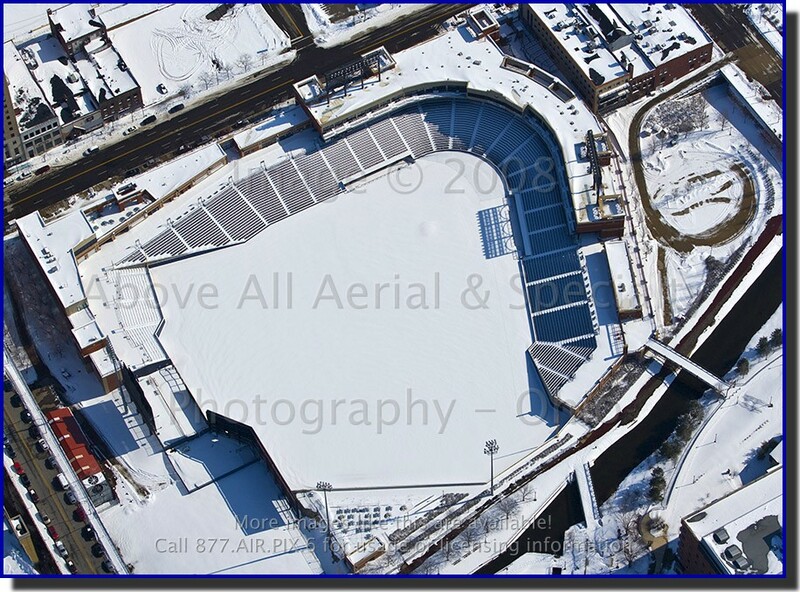 Hard to believe that baseball season is less than a month away when the stadiums all look like this! This photo shows Canal Park, home of the Akron Aeros minor league team (AA), a day after 12" to 15" of snow pummelled Ohio. The pitcher's mound is a barely visible bump in the snow. 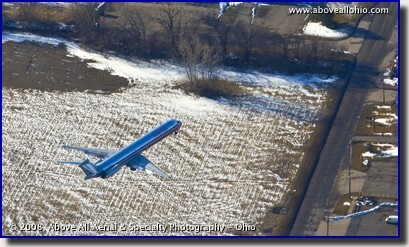 This picture looks straight down runway 10R at Port Columbus International Airport in Columbus, Ohio. 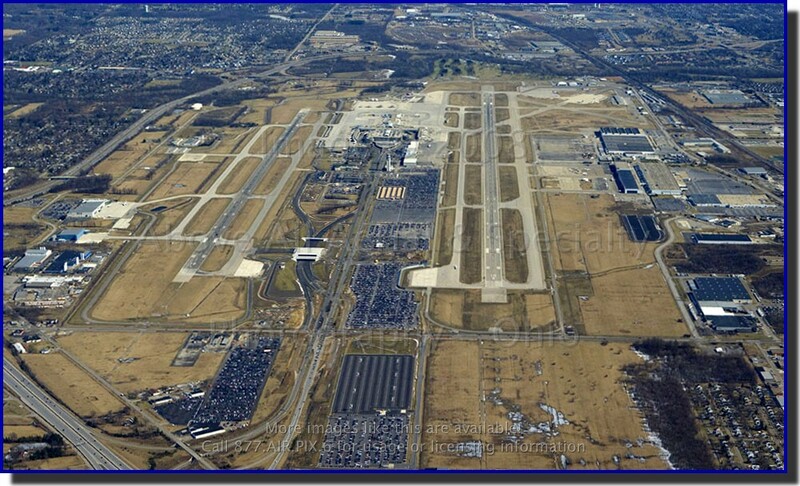 The passenger terminal lies between the two parallel runways as do acres of parking spaces for passengers and rental cars. 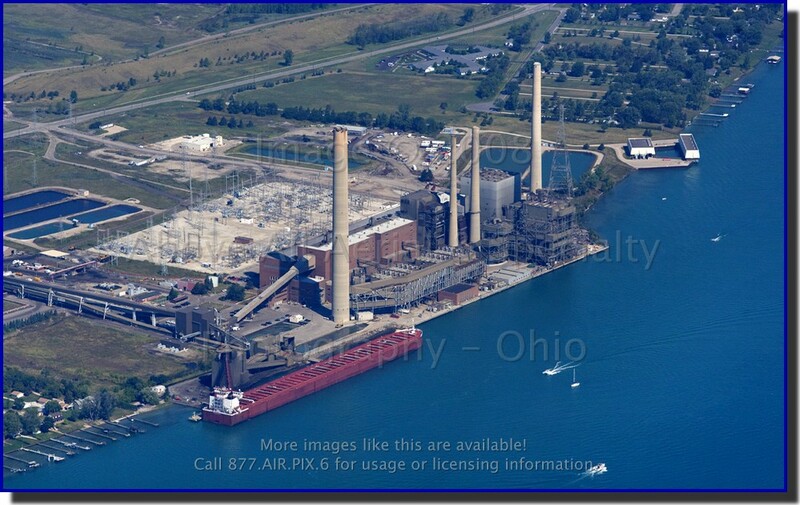 In the lower photo, Port Clinton, Ohio, is in the foreground. 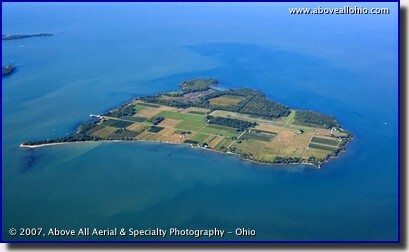 Across 3 miles of cold and icy Lake Erie, off of the northernmost point of Catawba Island, lies South Bass Island. 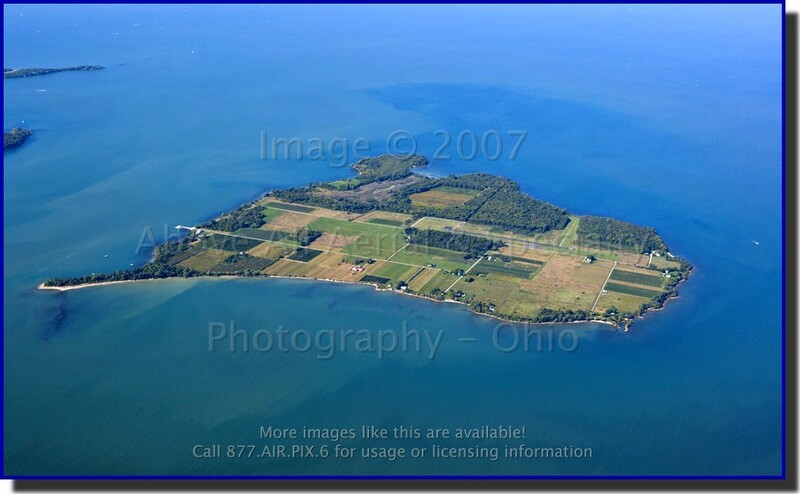 At the extreme top of the photo is North Bass Island. 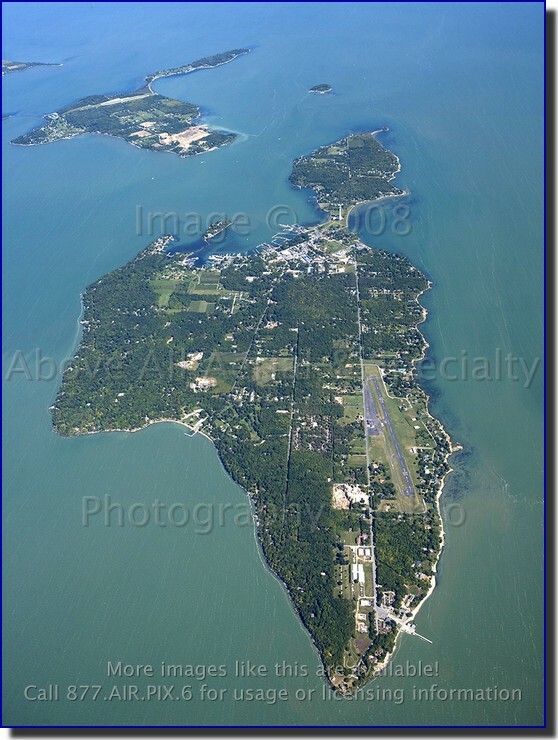 Appropriately, Middle Bass Island lies between the two. This colorful scene is a nice break from the nearly black and white scenery that is common during winter in the midwest. 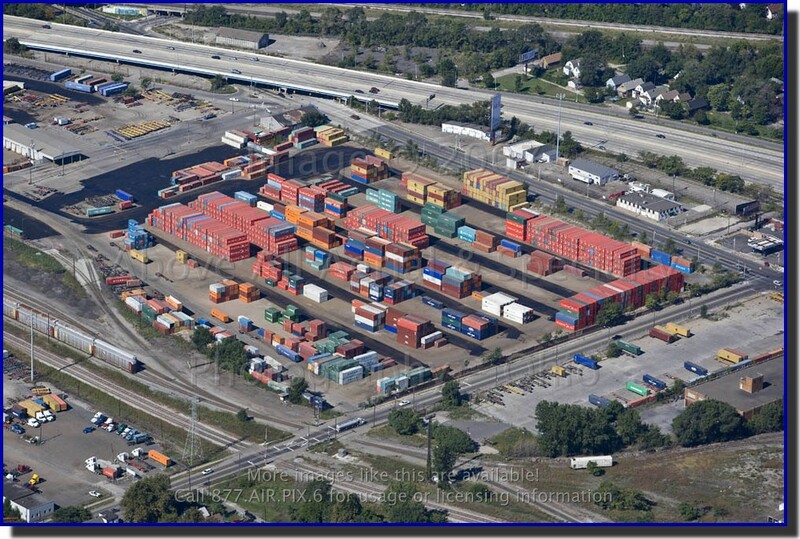 This is an intermodal yard where large ocean containers are transferred from rail cars to specially designed semi-truck trailers (and vice versa) for distribution throughout North America. 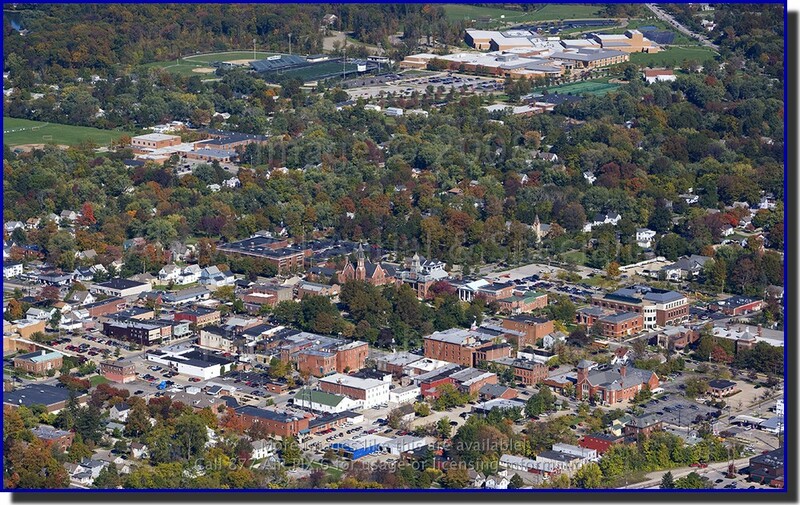 Norwalk is the county seat of Huron County, Ohio. 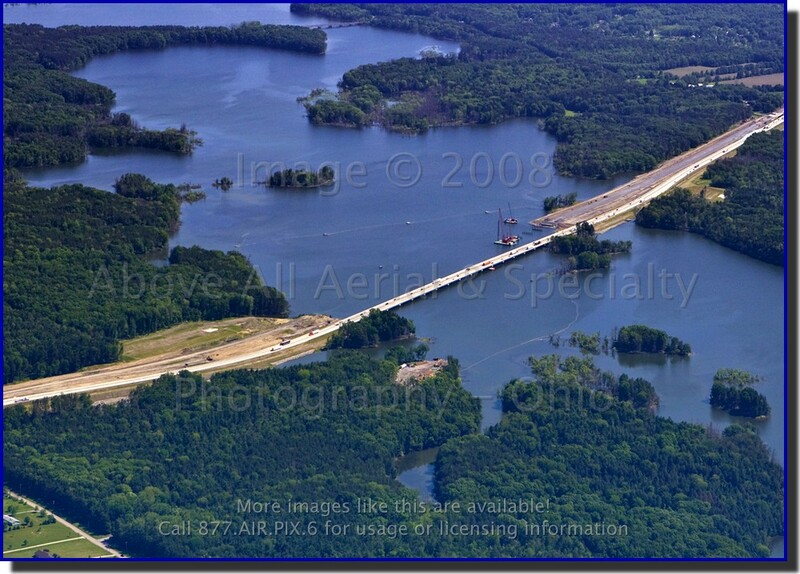 Because of its prime location near the Ohio Turnpike, U.S. 250, and several other major U.S. and state higways, many trucks pass through here on their way to various locations in the heart of north central Ohio. In 1946, a successful trucking company owner pursuaded the Norwalk High School to adopt the nickname "Truckers" - one of the first documented cases of a business purchasing naming rights! 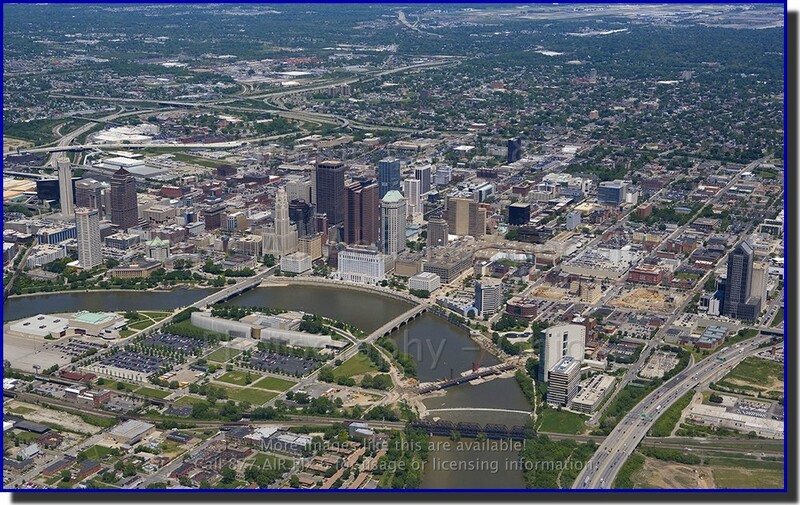 Downtown Columbus is the site of a couple of important construction projects. 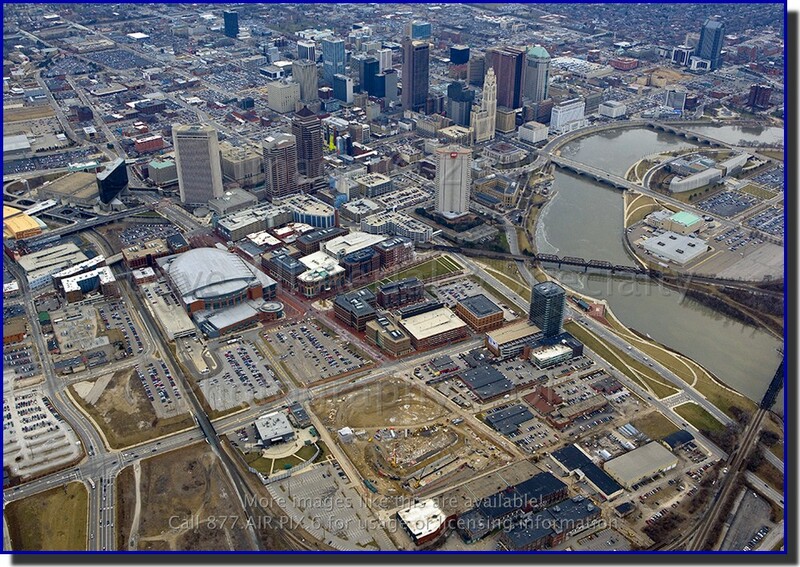 In the bottom center of this photo, the new Huntington Park baseball stadium is taking shape (just down the road from Nationwide Arena). 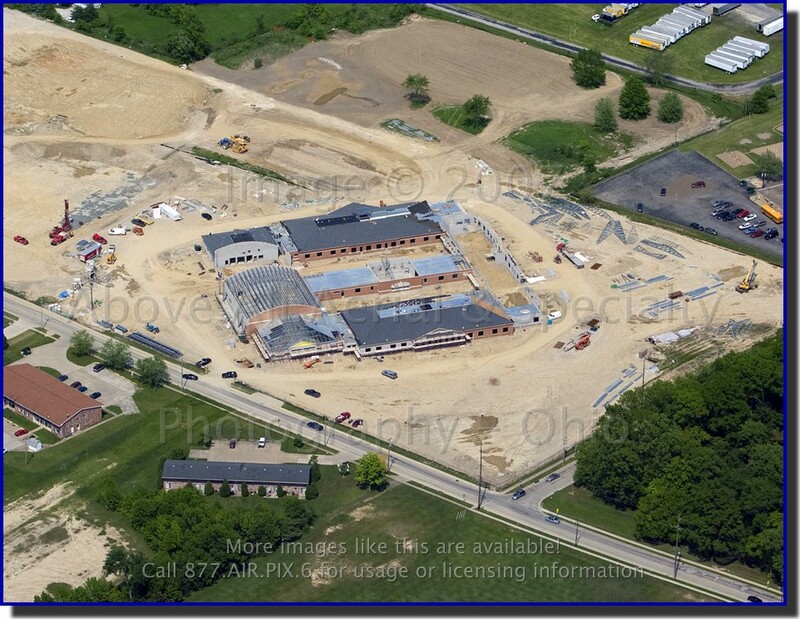 In the extreme upper right corner, the patch of brown dirt that is visible is where the new Franklin County Courthouse will soon be taking shape. Ski resorts in NE Ohio (and elsewhere!) are having a busy season. 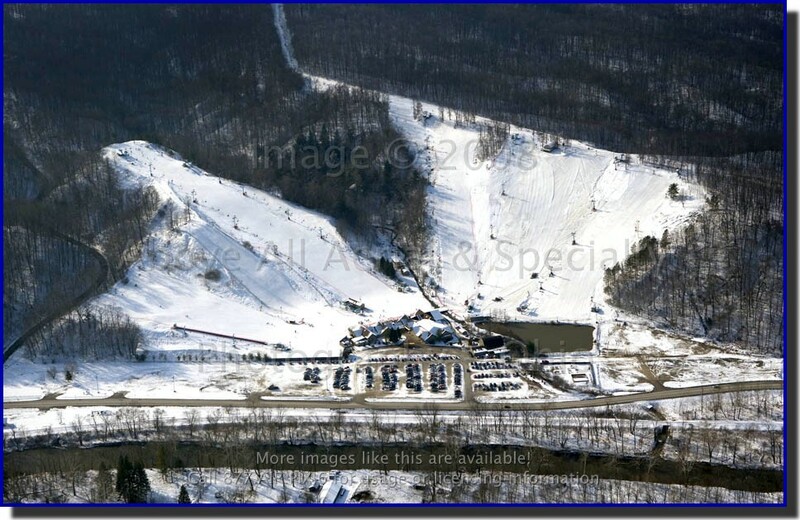 Although it is difficult to see in this very low-resolution image of Boston Mills Ski Resort, there are a surprising number of skiers on the various runs for the middle of the day in the middle of the week. The Medina Library celebrated with the grand opening of this new building on Saturday, January 12, 2008. 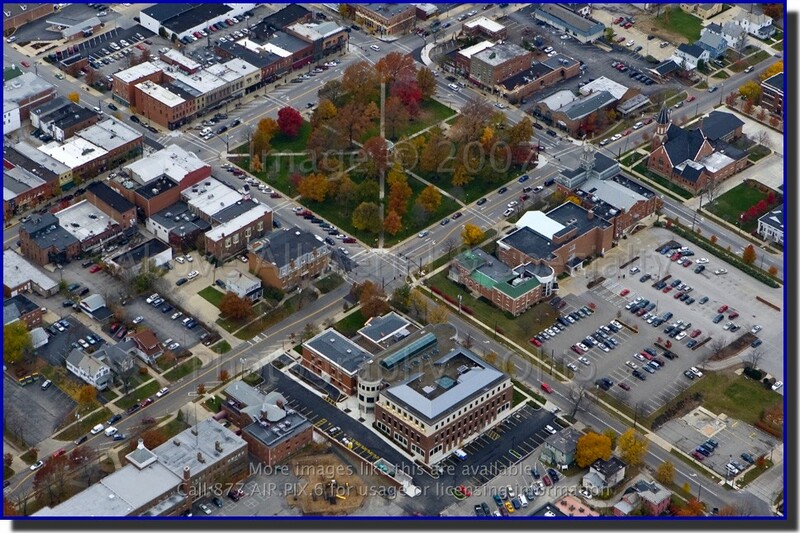 The new library sits on the SE corner of Medina's Public Square. 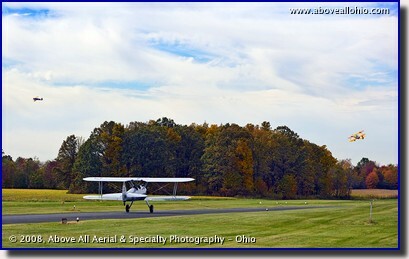 Both can be seen in this picture from late last fall. Lakes around Ohio are at unusually low levels thanks to drought conditions. 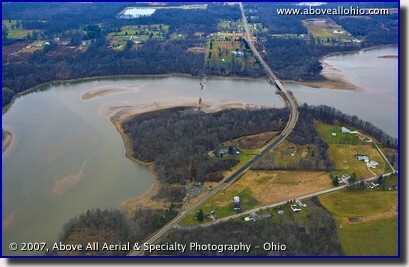 The old route across Berlin Lake, near Alliance, OH, is clearly visible due to the leafless winter trees and the low water level. On the right is State Route 225. Photos such as these may be useful to civil engineers, water conservation district officials, and/or natural resource departments. 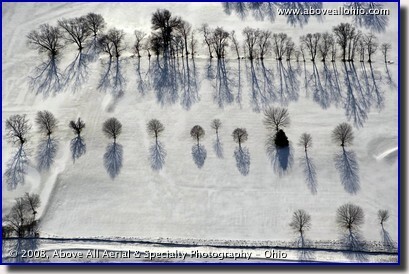 All design and content © 2007-2019 Above All Aerial & Specialty Photography - Ohio. All rights reserved.